Many web design companies claim to be the cheapest and most affordable solution. But lets take a close look at the facts. 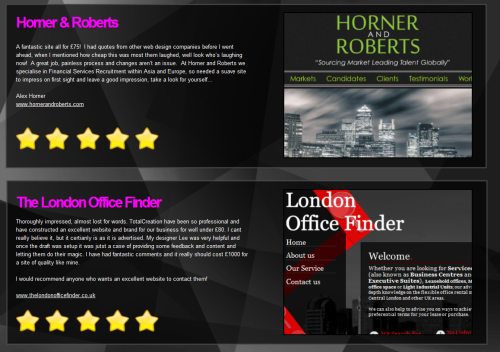 We have some excellent reviews made about our web design services. They give the client an excellent insight into how we work, the way we work and what the customer gets for their money. 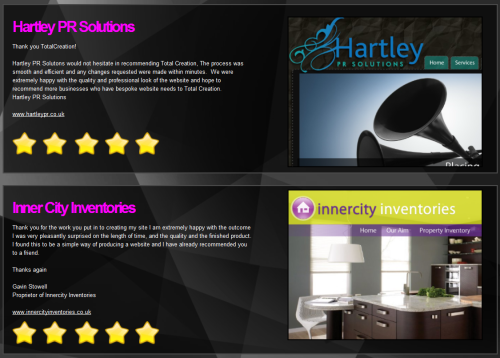 Our cheap web design service is truly the cheapest. We offer an 8 page website with paypal, domain names such as cheap web design co uk - We include Paypal with all our cheap web design services, cheap web design is a great way of getting an online presence. We also off CMS and Non CMS, this means we can build and maintain a site for you. Some clients do not want a CMS system as they do not have the time of know how to run a website. We offer a cheap web service, with updates from only £3.99 per page. All Total Creation Reviews have website links so you can visit the UK business and see why they have given Total Creation such an excellent review.